This batch was a product of the yeast and hop inventory in my fridge/freezer. I need to reduce the inventory of hops, and I had Omega Saisonstein on hand gifted by a friend. I decided to brew what has become my most-brewed recipe to date, Dorée, but effectively double the hopping, both in bittering and flavour / aroma additions. This beer was inspired by very bitter (yet enjoyable) examples of saison I’ve had in the past, such as Dunham’s Saison Reserve and Saison du Pinacle. The only modification to my typical grist was to use wildflower honey in place of plain white sugar, as I had purchased some at a good price. Mashed in at 10:15am at strike temp of 145F on the Grainfather (it quickly equalizes once grain is added, so no need for separate strike temp). Added 1/2 tsp of Calcium Chloride and 1/2 tsp of Gypsum before the grain. Mash water volume 4.1 gallons. Increased temp to 152F at 11:00 am. Mashed out at 11:45 am at 170F, started sparge at 12:00. 3.7 gallons of sparge water at 170F used. Boil started at 12:40 pm, with 6.5 gallons of 1.036 wort. After a two hour boil (and sugar added at flameout), OG recorded at 1.056 and 4.5 gallons were collected into the fermentor. Bottled May 13 with 145g of dextrose for 3.0 vols of CO2. 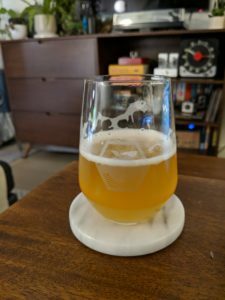 [Sept 9, 2018] This beer turned out well, as expected it is pushing the limits of bitterness for a bone dry beer but it is still drinkable. The hop character was a unique combination of lemon, gooseberry, and white grape which suited the style very well. At this point the hop character has largely diminished but the bracing bitterness remains, and enough character playfully integrates with the yeast character to keep the beer interesting. Carbonation is spot-on, with foamy pours and slow gushing but not overly so. [Nov 26, 2018] Still hoppy, still bitter – and a pretty well balanced beer considering the intent. Would I make a saison this bitter again? I don’t think so, but it opened my eyes to the option of pushing some of my go-to recipes a little further with the bittering hops.